Looking for Me by Betsy R. Rosenthal. Review: How would you feel living in a family of 12 children? How would you feel being number 4? No one asked 11-year-old Edith Paul her opinion about being squished in the middle of her enormous family. In Looking For Me by Betsy Rosenthal, Edith tries to find who she is and why she was given her lot life. This book of poems is filled with heartbreak, adventure, and surprises that help Edith find out who she will be in her great big family. 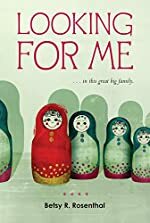 In Looking For Me, Edith Paul is just a regular girl living in Baltimore in the 1930s, but she has always dreamed of just wanting to be an only child. She could sleep in her own bed, and walk around without bumping into anyone. One day, her teacher Mrs. Connelly asks her who she is in her huge family. Edith just says that she's number 4, and nothing more. How could she find out who she really is? Edith has a ton of responsibilities- from emptying the ice tray to watching her little brother Melvin every second of the day. In some ways, she is the little mother of her family. Eventually, Edith's father, who is always yelling at his kids, makes her stay late at the diner. An unexpected tragedy hits the Pauls. How can Edith take care of herself anymore? I think Looking For Me is a great book for 5th grade and above. This is because there are some intense scary parts of the story. But other than that, this story has a great message because it can teach kids that you CAN deal with whatever life throws at you!! I definitely give this book a 5 out of 5 stars mainly for its message, but also for its unique setting. Plus the style in which the story was written is unique and contributed to my enjoyment of the book. It definitely grabbed my attention. I honestly could not put it down! Review written by Sofia (6th grade student). We would like to thank Houghton Mifflin Harcourt for providing a copy of Looking for Me for this review. Have you read Looking for Me? How would you rate it?